To consider the Rock Xtreme 786 a routinely luggable laptop would be to would risk months in traction. 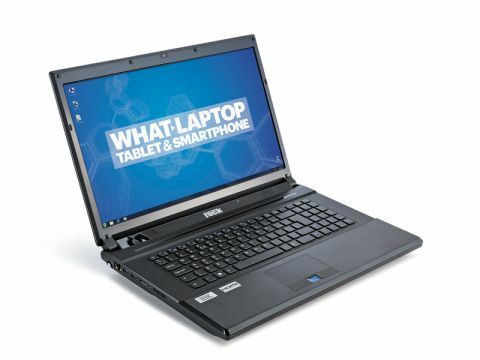 It weighs in at nearly four kilos and offers a 17.3-inch LCD display which is great for gamers and movie lovers. Better, therefore, to think of the Xtreme 786 as transportable rather than portable. The sort of one-piece rig that's perfect to take to university at the beginning of term or to haul to a friend's house for a special occasion. Just don't imagine you'll be whipping it out for five minutes fragging on the tube. Of course, Rock isn't entirely responsible for the Xtreme 786's gargantuanism. The chassis hails from a maker of white label laptops, which have been re-branded by Rock, and packed with some seriously powerful components. As tested, the headline specification is very impressive. Intel's Core i7 2630QM CPU is responsible for general computing duties. And very fit for purpose it is, thanks to four cores, and an appetite to tear holes in computational conundrums. This will handle anything you can throw at it, multitasking with ease. Next up is Nvidia's GeForce GTX 485M mobile GPU, complete with 2GB of memory. It's pretty much the same chip as the supposedly new GeForce GTX 580M, so in raw performance terms it's about as good as it currently gets in laptop graphics. Rounding out the digital paraphernalia is a pair of conventional 500GB hard disks, 6GB of system memory which results in an extremely responsive system. There's also a pair of USB 3.0 ports and a Blu-ray drive, which really help to future proof this machine. What really marks the Xtreme 786 from other gaming getups is support for Nvidia's stereoscopic 3D Vision gubbins. That includes an IR emitter built into the chassis and a pair of 3D Vision active-shutter goggles in USB, rather than wireless trim. Combined with the large, 1080p LCD panel, the result is a gaming spectacle that pretty much defines what is currently possible with a mobile(ish) machine. OK, the big LCD screen relies on older 'TN' technology, which in real terms means that it's miles behind the Sony F Series in terms of colour saturation and contrast. It's still a nice panel, which looks pin sharp, and serves the stereoscopic 3D remit with fast response times. How much of an attraction 3D Vision is, on the other hand, is down to personal preference. We're not convinced by any stereoscopic tech that requires the wearing of glasses. The Nvidia 3D Vision itself works well enough, even with the most demanding games thanks to the ample performance of the GTX 485M graphics card. The Rock Xtreme 786 is a powerful gaming machine, and a good buy for all gamers who are interested in 3D fragging. However, we still feel that the excellent Sony VAIO F Series is a better bet for everyday users.